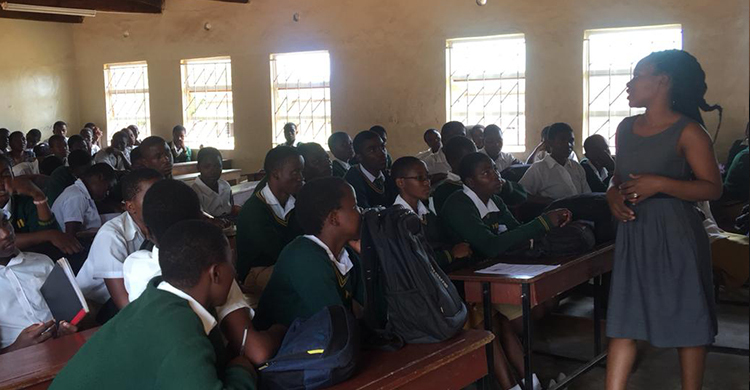 The Malawi Revenue Authority is visiting learning institutions in Lilongwe at the start of a two-week long campaign where MRA is making tax presentations to various schools and colleges in the Centre and North. The Authority has already made tax presentations to Paramount Academy as well as Bambino and Chigoneka secondary schools in the City. In her opening remarks at the three institutions, Mrs. Dorothy Mataya, Manager Taxpayer Service, thanked management of the schools for allowing MRA to make the tax presentations despite their tight programmes. During the presentations, the Authority explained the importance of taxes to national development, how Pay As You Earn, Withholding Tax and Value Added Tax are administered and operated. MRA also explained the procedures that importers should follow at the border with imported goods and how duty is calculated, among other things. The Authority also took the opportunity to emphasize on the need to demand EFDs receipts when students purchase taxable items as well as drilling them on how they can report suspected cases of tax evasion, fraud and smuggling through the Tip Offs Anonymous Service and MRA Informant Scheme. In this regard, Mataya urged the students to take tax lessons seriously and read more on the subject so that they become tax compliant and be role models in future after finishing school. “We bank on you to help MRA promote tax compliance when you become employers, business captains and community leaders since you have the requisite tax knowledge now,” pleaded Mataya. Students asked questions like: Do expatriates working in Malawi pay taxes? Does MRA allow some organizations to import goods into the country duty free? and What penalties does MRA give to small scale businesses in the rural areas who fail to register or pay taxes? just to mention a few. After the presentations, members of staff thanked MRA for the initiative which they said would go a long way in shaping the students approach towards tax subjects. Apart from making tax presentations, the Authority is giving out tax pamphlets to the learning institutions for their libraries as one way of equipping students and members of staff with tax information, skills and knowledge. Besides that, MRA is also giving out prizes like hard covers, mathematical instruments and pens to students who answer tax questions correctly after the presentations. Mrs. Thokozani Chiwaya and Mrs. Mataya from the Corporate Affairs Division are working jointly with Technical Officers from the stations at these meetings.